Inspiring articles on our faith! In the Liturgical year, the Church celebrates the whole mystery of Christ from the Incarnation until the day of Pentecost and the expectation of Christ’s second coming. The summit of the Liturgical year is the Easter Triduum—from the evening of Holy Thursday to the evening of Easter Sunday. Through chronologically three days, they are liturgically one day unfolding for us the unity of Christ’s Paschal mystery. The presence of the risen Lord and his saving work permeates the entire Liturgical Year: Advent, the Christmas Season, Lent, the Easter Season and Ordinary time. Sometimes, one of the hardest things to explain as a Catholic is our attachment to symbolism. Palm Sunday is a great example of that. We come home from Mass holding palm branches, and we tuck them behind a crucifix or next to the picture of the Last Supper. To anyone who does not know our faith, it looks as though we stuck a few weeds on the wall… imagine their questions! The truth behind this tradition, however, goes to the story of Palm Sunday, when the people heard that Christ was coming and “they took out palm branches and went out to meet him, and cried out ‘Hosanna! Blessed is he who comes in the name of the Lord, [even] the king of Israel.’” (John 12:13). It was a tradition to spread palms before a king as he processed into his city. It was a way to welcome him, to show him glory and homage. Thus, Christ, the true King, was welcomed into Jerusalem. 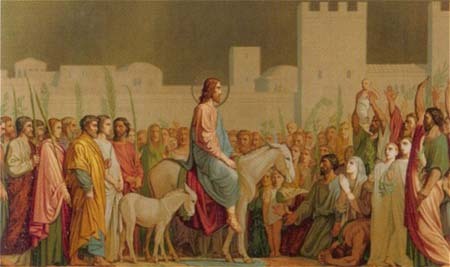 This fulfilled the prophecy in the Old Testament, which declared, “Behold: your king is coming to you, a just savior is he, humble and riding on a donkey.” (Zech. 9:9) It revealed that Christ was a great king, but also a humble king. The people greeted him with wild joy and cheers of Hosanna. But one short week later, they crucified him. We celebrate this feast and carry palm branches home with us to commemorate the great humility of Our Lord, who loved us so much that he chose the cross for our salvation. Now you can easily view or download the Bulletin from Discover Mass. Just follow the link. April 15th: Eucharistic Holy Hour beginning at 5 pm at St. Mary's followed by dinner. April 19th: Good Friday: Stations at Noon. 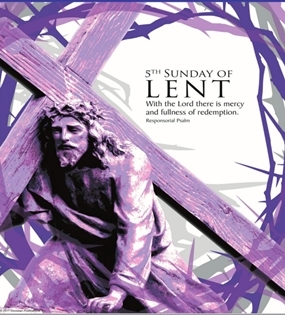 Liturgy of the Passion beginning at 1:00 pm. April 20th: Holy Saturday: Blessing of Easter Baskets at 11:30. Confession following. Easter Vigil Ceremonies beginning at 8:30 pm. Ave Maria Parish is a Catholic faith community who welcomes all people to our Christian family. We are disciples and sacramental followers of Jesus Christ. In our chosen vocations, we call upon the Blessed Mother’s intercession and recognize the power of the Holy Spirit within each of us to carry out God’s work. We strive to grow together in holiness through prayer, reception of the sacraments, faith formation and evangelization. Through the grace of God, we extend ourselves to each other and our community to proclaim the love and teachings of Jesus Christ.